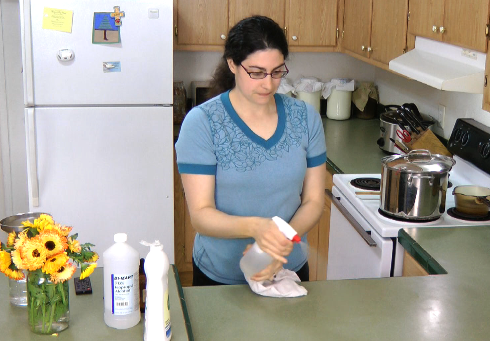 I made up this natural, homemade, all-purpose cleaner recipe years ago. I copied a more expensive cleaner that I really liked. I looked at the other cleaner's ingredients and realized I had everything it included, so I started making it myself for a fraction of the cost. We use this cleaner for general purpose cleaning throughout the house — kitchen, bathroom, dusting and more! I write the recipe on the side of the bottle so others in the household can make more as needed. We keep one spray bottle in each bathroom and one in the kitchen. The recipe is so easy. Too easy for a video, perhaps. But since I get requests all the time for what cleaners I use — here you go. See the top for the video recipe and below for the print recipe. Do you have a favorite homemade, natural cleaner? Please share! I'm sharing this post with Simple Lives Thursday. is that about 2 cups of water? I use a 1:1 ratio of vinegar to water. It works really well (and I love that I can put it on my kitchen counter and it doesn’t matter if it gets on the food – well, other than taste!). My husband doesn’t like the smell of vinegar, so I’m going to pick up some essential oil to add to it, hopefully it’ll cover the smell enough to make it bearable. At this point I just warn him that I have just sprayed vinegar and not to come close! 🙂 Although he claims to be able to smell it for quite a while afterward! grapefruit oil has an awesome scent. I keep a large glass jar of white vinegar under my bathroom sink. Whenever I use a lemon I put the rind in the jar. Every once in a while I take out the spent lemons and start replacing again. I mix this lemon-scented vinegar 1:1 with water in a spray bottle! Just top up vinegar as you use it. Works great!! That sounds great Wardee. I cannot use alcohol…I wonder if I could sub with vinegar? I am wondering how you make your homemade liquid soap? I am very excited to try this, thank you! Always love watching your videos – i really enjoy them!!! I’m sorry, I haven’t written it up officially yet. Gonna have to do that! I wonder if you have ever measured how many teaspoons/tablespoons 30 drops would be? I dont have a dropper…..
Allison — Good question! 30 drops is 1 teaspoon, at least with liquid rennet. 🙂 I can’t think why it wouldn’t be the same for EOs. Most essential oils use a smaller dropper. For instance, a 5mL bottle is 1 teaspoon, but most 5mL bottles hold from 70-100 drops of oils, depending on the viscosity of the essential oil. I would start with 1/4-1/2 teaspoon and see if that works. That sounds great! I have seen some other recipes and never liked them. I currently use diluted castille soap but this sounds better. I wanted to be sure I was disinfecting. Thanks! I LOVE the idea of writing the recipe on the bottle! Perfect! I love it! I just made some and it performs wonderfully well. Thank you, Wardee! I am going to try your alcohol cleaner. I was using vinigar water. I now also use Hydrogen peroxide water in places like the bathroom and floors where my baby crawls around. Thanks for sharing your recipe. Your videos and directions are always so simple and easy to follow! Thanks. I’d like to try this in our home. I did try a similar “recipe” for a spray for the shower each day, and it didn’t work well at all, but for counters, etc., this should work well! Do you have anything different you use for cleaning toilet bowls? I, too, always wonder how others properly (yet naturally) disinfect their toilet bowls! That is the one place I dread [shudder] to clean, probably because I’m a bit OCD. 😉 I would love to know how you do it! That sounds like a great recipe that I would like to try—-thanks for sharing! Do you have a source for essential oils that is reasonably priced? Laura — I purchase mine from Azure Standard or Mountain Rose Herbs. I have not found them exorbitant. As good essential oils are not cheap, these prices seem reasonable to me. Another good quality source is Heritage Essential Oils. I order from Young Living as well, and found HEO to be on par with quality, and much cheaper on price. I believe the website is http://www.heritageessentialoils.com, but I would suggest you google it to be sure. Their customer service is excellent (family owned and operated) and their shipping turnaround is pretty quick. Oops! Guess I should have read all the comments first before responding! Well, at least you know 2 people love Norwex!! I am very excited to try this, thank you! Mix soap and soda toghether and work out the lumps with a fork. I currently use diluted castille soap but this sounds better. Scoop out with soft cloth. Adding (rubbing alcohol) to your cleaning solution looks interesting. I have not tried this mixture and am anxious to see how it’ll do. I absolutely love tea tree oil with its antibacterial and antiseptic attributes. And, while certainly not as inexpensive as vinegar or hydrogen peroxide; the aroma left behind is certainly easier to live with (when using vinegar). Will be giving your home-brewed blend a go soonest – Thanks for the tip Wardee! I use vinegar water (1:1) for *lots* of things: kitchen counters, sinks, faucets, light switches, vinyl mattress covers after a night time accident. So versatile and safe around food (and generally around big kids). Once in a while I use hydrogen peroxide too. Hi Wardeh, I make your home made castile soap bars. I saw above that you also make castile liquid soap. Are you planning to do a video on that? I’d love to learn how to make the liquid soap. Thanks for being a blessing. Lyndsay Booker-Arbenowske, when I first saw this picture I thought it was you! silly question–what size is the spray bottle??? I just used this on my counters, stove top, fridge and even got down and cleaned the kitchen floor with it and my kitchen smells wonderful!! I didn’t have any liquid soap, so I used 2 tbsp. of Palmolive and added some extra alcohol. Floor feels great on bare feet! Thank you, for a great tip! My very favorite cleaner! Use it everyday! I just used one I put peppermint in to clean my bathroom and it smelled like candy canes for a long time! DIY All-Purpose Cleaner — recipe. I have been using this for several years and absolutely LOVE it! TY! I use lavender EO for killing germs and smells gr8! It’s just alcohol and soap. How does that clean stuff? I’d love to use it if someone can explain that to me please. – peel about 6 lemons and put the peel into a gallon of vinegar and let sit at least 24hours. -clean out a reusable spray bottle (or buy a new one) and fill it up about half way with warm water and then fill the rest up with the vinegar solution. Add about 30 drops of citrus essential oils (optional) and clean like there’s no tomorrow. The vinegar can hardly be smelled and you have an all-natural cheap and great working all purpose cleaner. Could I substitute witch hazel for the alcohol?